Tuesday, February 5, 1:00 p.m. – 3:00 p.m.
Wednesday, February 6, 9:00 a.m. – 11:00 a.m.
Thursday, February 7, 12: 30 p.m. – 2:30 p.m. So I got called out to see an orchard that had dieback. Over the phone it sounded like “Dothiorella Leaf Blight” (//ucanr.edu/blogs/blogcore/postdetail.cfm?postnum=10354). This symptom shows up when there has been water stress of some sort, over a period of a few weeks to months. It can be a branch or a whole tree. It usually is due to a watering schedule that doesn't meet the needs of the plant. It is exacerbated by competition from more aggressive plants nearby, like eucalyptus windbreaks. With increased competition over time, root rot can also start taking its toll because of the stress, as well. 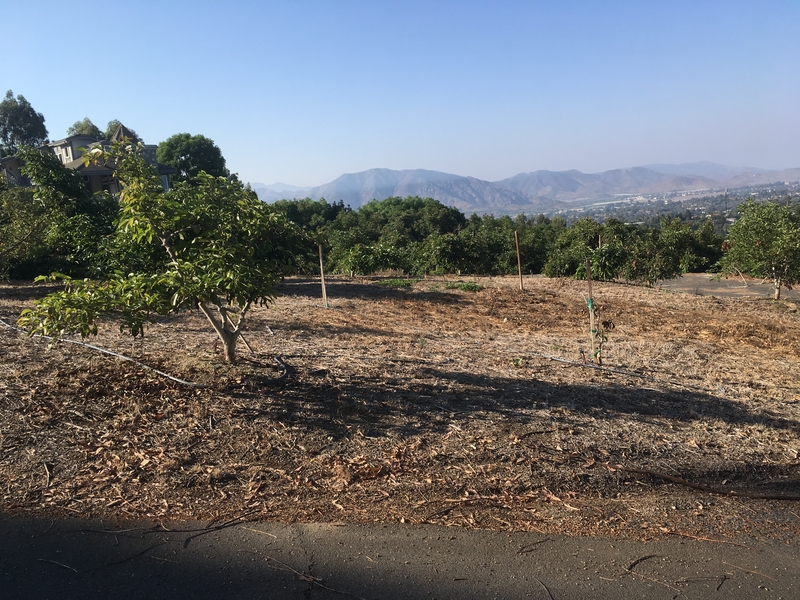 Where you see areas cleared of trees, and where there are struggling trees in various stages of survival, it's a good indication of a rough environment. Trees with root rot symptoms may have been stumped previously, and with their weakened root systems are more prone to leaf blight. 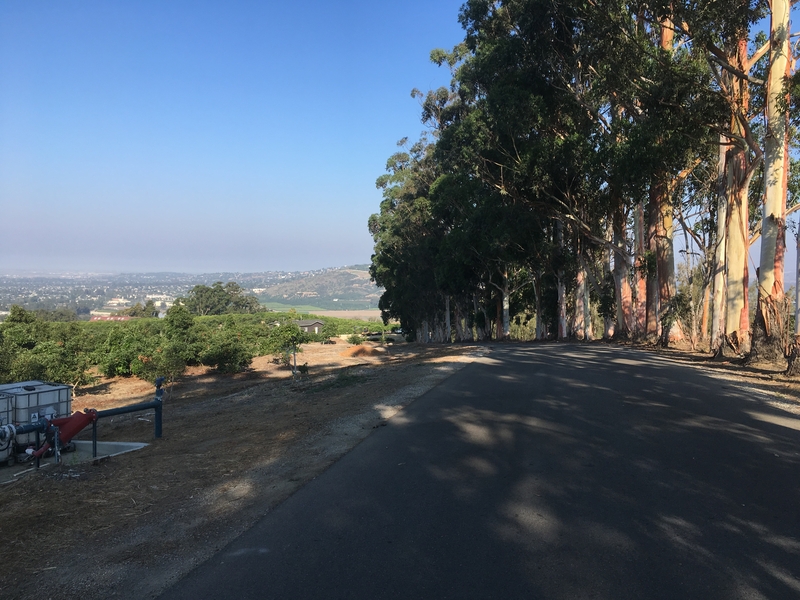 In the case of this grove, it was at the top of the hill where it got all the wind and a full day's sun above the typical coastal fog. So the grower asked about the damage. There was the heat damage from the July heat wave. Then there was the damage that had showed up earlier, the leaf blight that was associated with the ongoing water stress. 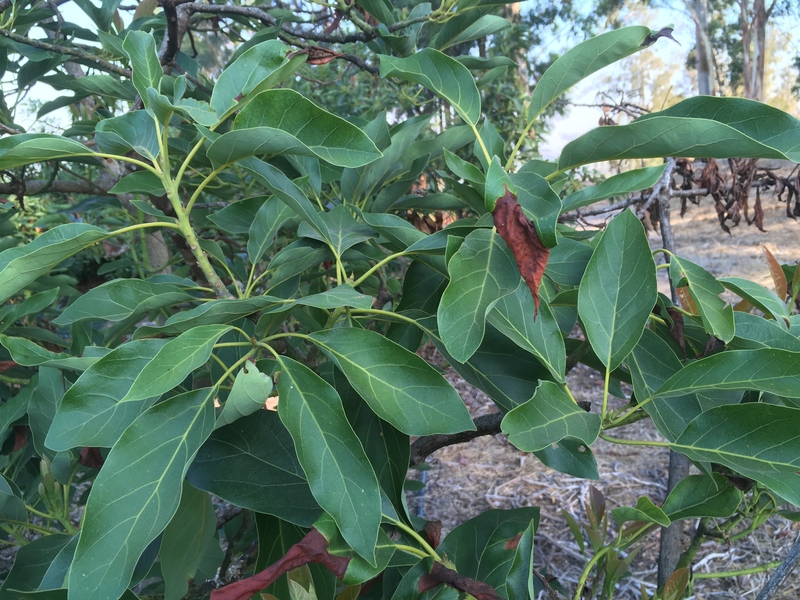 In a way, both of these symptoms are of water stress, one very rapid, hence the reddish tint to the leaves. The other a slower collapse, the leaf blight from prolonged water stress. Over time, this type of stress had allowed root rot to take hold and trees were stumped in order to help them survive. The trees were also started on a regular phosphonate program. In general, the rest of the orchard looked good, except for this area near the competitive windbreak trees. The heat damage was mostly in this area, as well. The grower had been forewarned of the impending heat and irrigated the trees prior to the hard weather. 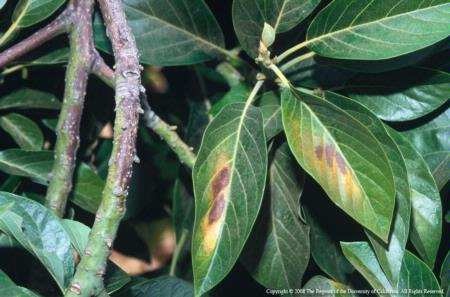 In the case of heat damage or blight, and leaf/stem blight, it's not fatal for mature trees. Younger trees under two years can be killed. They usually need whitewashing to prevent sun burn damage. But even they can be revived if the watering is improved. PULLMAN, Wash. Soil pathogen testing - critical to farming, but painstakingly slow and expensive - will soon be done accurately, quickly, inexpensively and onsite, thanks to research that Washington State University scientists plant pathologists are sharing. As the name implies, these tests detect disease-causing pathogens in the soil that can severely devastate crops. Until now, the tests have required large, expensive equipment or lab tests that take weeks. The soil pathogen analysis process is based on polymerase chain reaction (PCR) tests that are very specific and sensitive and only possible in a laboratory. 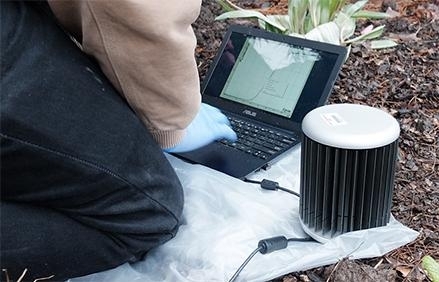 The new methods, designed by WSU plant pathologists, are not only portable and fast, but utilize testing materials easily available to the public. A paper by the researchers lists all the equipment and materials required to construct the device, plus instructions on how to put it all together and conduct soil tests. "We've heard from many growers that the time it takes to obtain results from soil samples sent to a lab is too long," said Kiwamu Tanaka, assistant professor in WSU's Department of Plant Pathology. "The results come back too late to be helpful. But if they can get results on site, they could make informed decisions about treatments or management changes before they even plant their crop." Some diseases from soil pathogens may not be visible until weeks after the crop has sprouted, Tanaka said. That could be too late to treat the disease or could force farmers to use more treatments. WSU graduate student Joseph DeShields, a first author on the paper, said it took about six months of work to get their device to work in the field. It relies on magnets to capture pathogens' DNA from the soil. "It turns out, it's really hard to separate and purify genetic material from soil because soil contains so much material for PCR tests," said DeShields "So we were thrilled when we made that breakthrough." Rachel Bomberger is a WSU plant diagnostician who helped with the concepts of the machine testing. She said she's impressed by what Tanaka and the team accomplished. "We removed a huge stumbling block when it comes to soil testing," said Bomberger, one of the co-authors on the paper. "We found the missing piece that makes the testing systems work in the field without expensive lab equipment or testing materials." The system was tested on potato fields around eastern Washington, Tanaka said, but it will work on soil anywhere in the world. "It's a really versatile method," he said. "You could use it for nationwide pathogen mapping or look at the distribution of pathogens around the country. We started small, but this could have huge implications for testing soil health and disease." Tanaka said it was important for this discovery to be available in an open-access video journal. "We're always concerned about helping every grower and the industry as a whole," Tanaka said. "We want everybody to look at this and use it, if they think they'll benefit from it." The results were published in the Journal of Visualized Experiments, an open-access journal that includes a video showing how to assemble and used the system and a full list of materials needed to use their method. This research is supported by the Northwest Potato Research Consortium and the Washington State Department of Agriculture - Specialty Crop Block Grant Program. 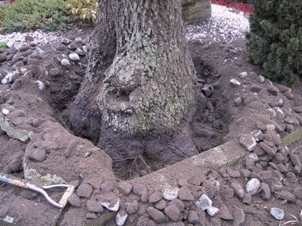 A trunk "below grade", that is a buried trunk, is a problem for most trees. Willows and other riparian trees along water ways that are inundated regularly can adapt to a change in soil depth around their trunks. 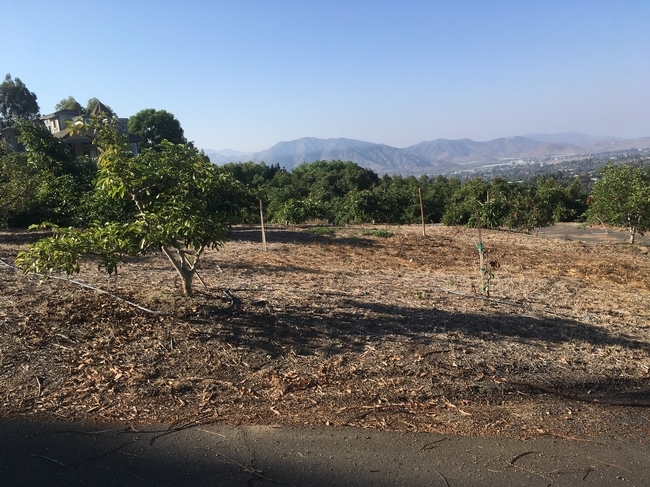 That's not true of most of our commercial tree species, and avocados and citrus are really susceptible to buried trunks/stems. they asphyxiate. This can be a very common problem at planting when a hole is too deep and the new tree settles in the loosen earth and gradually the stem is buried. Or, when the grower is doing the "right thing" and using an organic planting mix that gradually decomposes and the tree settles into the ground and the crown is covered by dirt. The tree then starts looking bad - leaves yellow. The canopy defoliates. All the while, the grower is putting on more water and more fertilizer and the tree looks worse and worse. Remove the soil from around the base, and voila, in a few months the tree is happy again. If the dirt isn't moved, the stressed tree is now susceptible to root rots, both Phytophthora and Armillaria. Those problems are a lot worse than just lack of air. This suffocation is a common problem after flooding. Dirt from higher up moves into lower positions, gravity moving dirt can move a lot. It accumulates around the base of the tree. The grower is preoccupied with other things that occur with flooding and does nothing. A few months later, the trees start turning yellow especially when the weather warms up and they are more active and more water is being applied. Flooding can also spread disease organism from other areas that are contaminated. Oak root fungus is frequently spread in flooding waters, especially in the lower positions in little valleys. 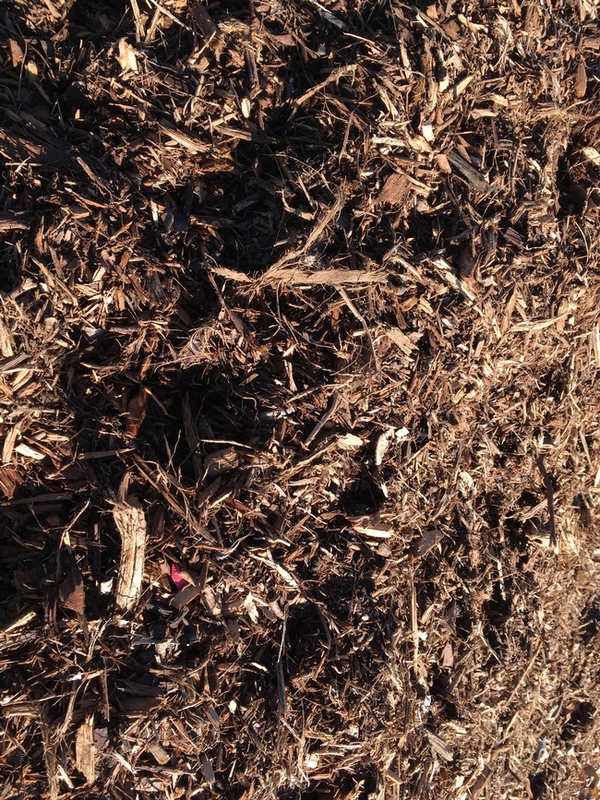 Pulling that accumulated soil away from tree is important for tree health. It's something that needs to be done soon after the flooding incident, or any event that buries the tree trunk. 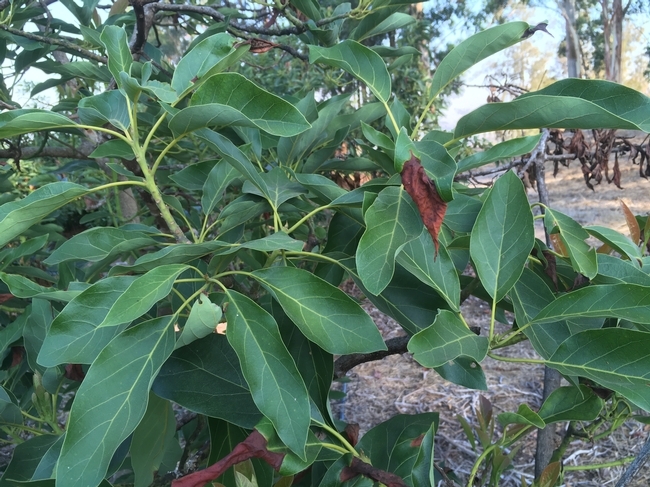 Where is Avocado Root Rot Lurking? 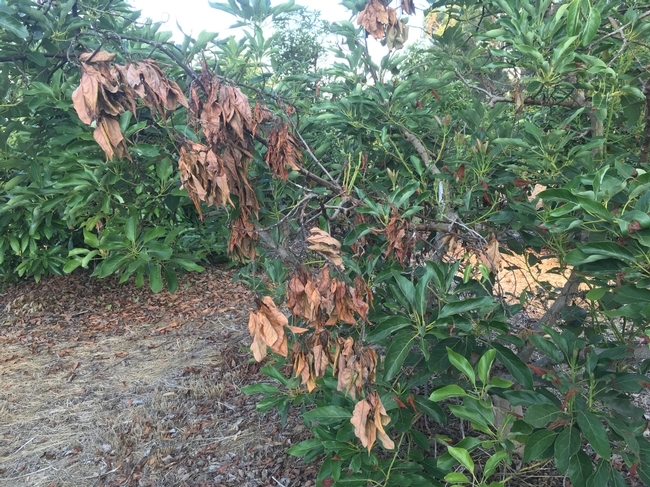 So where is the highest potential for avocado root rot in California? It turns out that the Natural Resource Conservation Service has taken the soils maps that have been generated for use by growers, engineers, planners and others over the years and used the data to rate soils for their sensitivity to root rot conditions. In many cases the county-based maps have been updated with new information, as well. 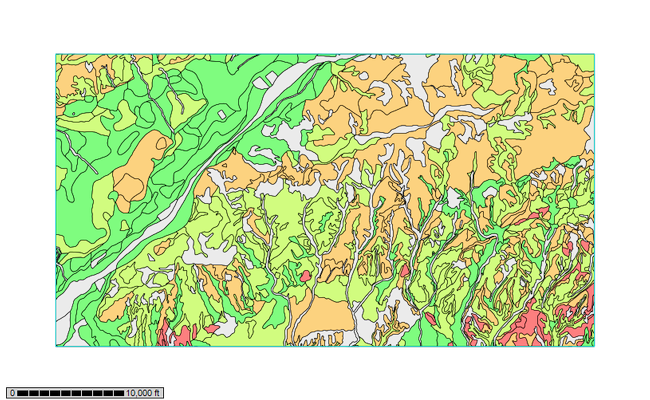 It is now much easier to see where root rot would be more likely. The two major soil characteristics of soil texture and depth and how they affect drainage are the major parameters used to assess the root rot hazard. 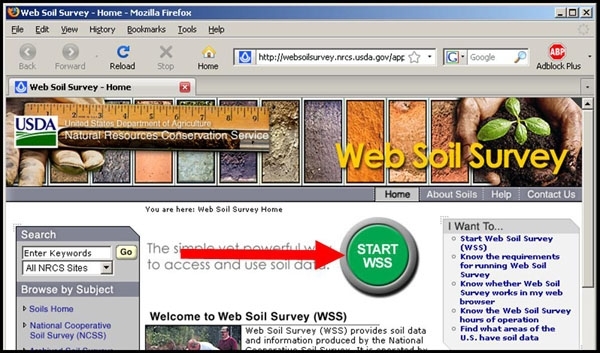 The soil surveys for years were only available in printed form, and then became available online about 2005. Just recently the added feature of identifying “root rot” soils was created. 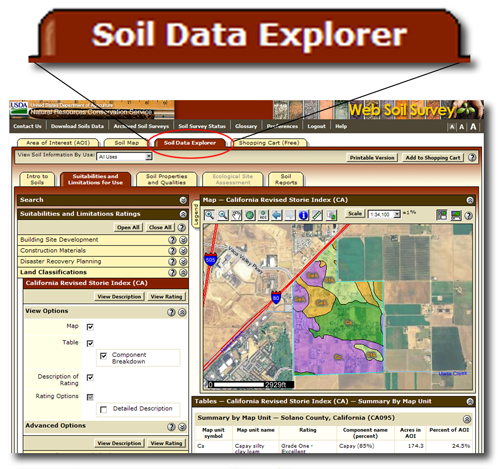 Now at the touch of a button, maps of where these soils are found are available. 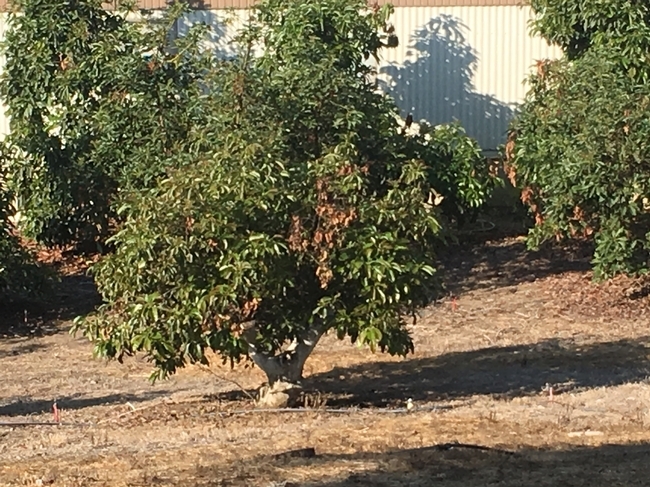 It looks like all California counties can be viewed from an avocado root rot hazard, even though avocados may not be grown in that climate, like Humboldt, but who really knows what can grow there. Soils that are conducive to Phytophthora root rot for avocados, would also be conducive for root rot in other plants species, as well. So, this information is helpful for identifying where rhododendrons or other susceptible species might have problems, as well. Of course, this is just the first step in assessing the potential for root rot. Irrigation management is critical for creating root rot conditions that can occur even in soils that are not conducive to the disease. So, a soil identified as having a higher potential for root rot does not mean you cannot plant an avocado in it. The key is water management and how the tree is planted and how that soil is managed. 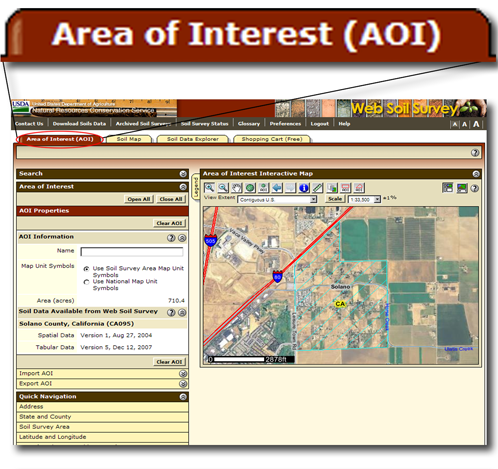 Click on “View Rating” and the map will appear with colored units showing root rot hazard along with a chart showing the root rot hazard of the different soils in the map. Wow. Watch out for those dark areas.